What is the 8th Grade Public Address? 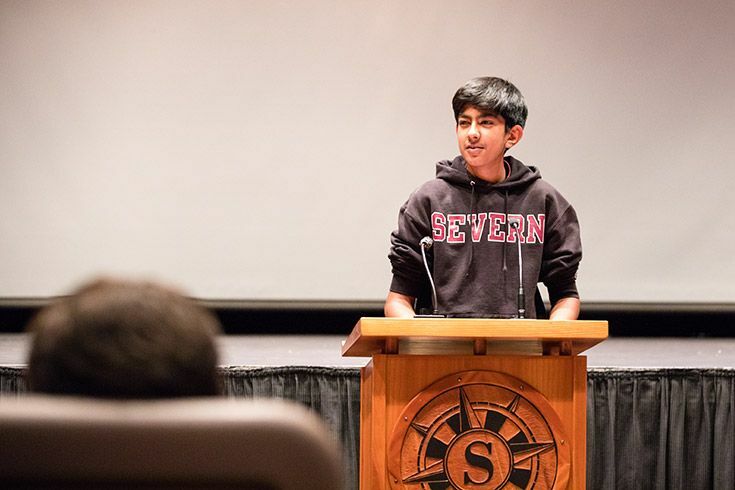 Every 8th grader must craft a two-minute speech that advocates for a local, national or global cause and address the entire Middle School with intention and persuasion. The element of choice is a critical piece of this assignment. Because they choose topics they care about, our students are invested in the research and motivated to create compelling speeches. They also practice presentation techniques like movement, timing, hand gestures and tone of voice. For middle school students who are hyper-aware of how they may appear to others, this part of the process is essential to build a foundation for speaking with clarity and confidence. Check out a video of the 8th Grade Public Address in action! Many 8th graders say this is one of the biggest challenges of their middle school experience, but also the most satisfying. Delivering these speeches gives every 8th grader a chance to find their voice, explore their purpose, and encourage reflection and action in those around them. While this project is a milestone for our 8th graders, it also brings the entire school closer together. Eighth graders share their voices as leaders of our Middle School while 6th and 7th-grade students learn how to listen with respect as they observe what purposeful writing and speaking looks like. These speeches help students in every grade develop both empathy and a sense of belonging as they learn about the interests and personal struggles of their peers.